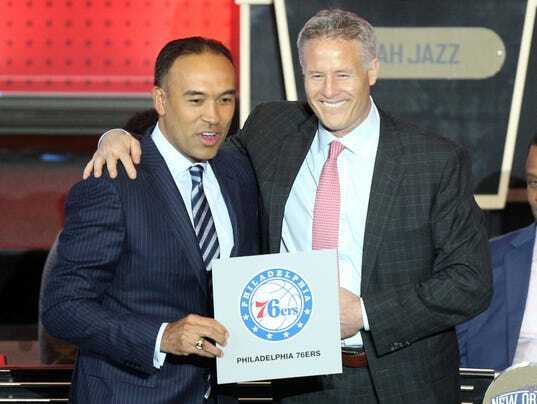 After finishing with an abysmal 10-72 record last season, the Philadelphia 76ers received the best news in three years last night when they won the NBA draft lottery. The Sixers now hold the first overall pick in the 2016 NBA Draft. The Sixers have lost a staggering total of 199 games over the past three seasons, leaving even the most die-hard fan deflated of hope. Maybe, just maybe, last's night victory will resurrect that hope. The 76ers not only hold the top overall pick, but also the 24th and 26th picks in the first round. If history does indeed repeat itself, then new Philadelphia 76ers' New president and GM Bryan Colangelo (and long suffering Sixers fans) should remain rejoiceful. The last time the Sixers selected first overall was in 1996, and they drafted then Georgetown star Allen Iverson, whose Hall of Fame career was predominantly carved out in Philadelphia. As a star of the 76ers, Iverson racked up plenty of awards and honors including NBA Rookie of the Year, NBA MVP, and 11 NBA All-Star appearances. He is considered one of the greatest Philadelphia 76ers ever. That's no small feat considering the once proud franchise boasts former players such as Julius Erving, Wilt Chamberlain, Charles Barkley, Moses Malone, and Maurice Cheeks among others. Who Does Philadelphia Draft One Overall? Ben Simmons is the logical choice here. The 76ers and their fans are desperate for a star. In Simmons, they have one. The 6'10" combo forward can do it all on the court. In his one season at LSU, he averaged a double-double with 19.2 points and 11.8 rebounds. He also averaged 4.8 assists per game, 2 steals per game and shot 56% from the field. He has an NBA ready build and paired with center Jahlil Okafor and power forward Nerlens Noel, would provide the 76ers with a young, athletic, and formidable front court for years to come. It's an added bonus that 76ers Head Coach Brett Brown coached Simmons' father, Dave Simmons, and has known Ben Simmons since his childhood. Dave Simmons played 13 seasons in the Australian National Basketball League (NBL), including one season with Sydney Kings. Coach Brown coached both the Australian men's national team and the Sydney Kings. The other option at number one is Duke forward Brandon Ingram. He's a better scorer than Simmons at this point but his upside is not as high and he needs to add more to his frame. He doesn't possess as much versatility as Simmons either. The 76ers need a player with immediate star capability and Simmons has it. When a team averages 66 loses per season, as the 76ers have over the past three years, then there is clearly a dearth of talent on the roster. Two additional first round picks will definitely benefit Philadelphia. With the 24th overall selection, UNLV center Stephen Zimmerman is a good option. The freshman missed some time with injuries, but still averaged 10.5 PPG and 8.7 RPG. He has much developing to do, but would provide depth behind Okafor whose rookie season was cut short with a knee injury. Joel Embiid has declared himself ready for the upcoming season, but the number three overall pick from the 2014 draft has yet to play a single NBA game due to foot injuries. At this point, he is more of a question than an answer, including how he and Okafor will share minutes. A team can never have too many big men and Zimmerman provides insurance and depth. With the 26th overall selection, the 76ers can look to local college standout DeAndre’ Bembry. The versatile 6'6 wing from St. Joseph's can guard multiple positions and is a solid passer. Hollis Thompson and Nik Stauskas split time at the two guard position last season but neither has shown enough to lock down the job. Whom the 76ers draft is yet unknown, but what is known is that the franchise will be better with three new additions and possibly a starring rookie. For a team that hasn't been to the playoffs since the 2011-2012 season and has only netted a combined 47 wins the past three years, the 2016 NBA draft represents a much needed opportunity for the Sixers to revive their franchise. The NBA draft is June 23 in New York. Image credits: USA Today, Fox Sports, Forbes, Rant Sports.